Description: Amtrak train #40, the "Broadway Limited" passes under the Westinghouse Bridge. Description: AMTK 81, 134 on #8; CP 9625, 8517, on #573 meeting at the depot. 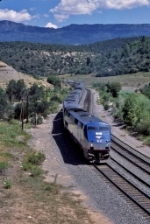 Description: Late running westbound Empire Builder races through Lowell. Description: A rear end view of the power for this evening's Meteor. Description: Amtrak's Silver Meteor has just stopped at Winter Park, and is boarding and detraining passengers and baggage. The train was supposed to arrive at around 11:00 AM, the auctauly arrival time was about 8:05 PM. According to an employee in the baggage car, the delay was due to a derailment on CSX in Georgia. Description: A closer look at the Super-late P097. Description: Eastbound Amtrak 81 entering the Utica, NY station. Description: Stopped Due to a Red Signal..